I there any way to show the edgeR and DESeq2 DEG results in one single volcano, AND showing their overlaps in a different colour (e.g. Non-significant= blue, significant = red, significant overlapped between both package= orange) ? Note: This is the code I usually use for drawing my volcano plot in Rsudio but I only can feed one counts.matrix file to it, each time. Dear zx8754. Hi and thank you for your help. I did not get the point clearly about "example data". If you mean counts.matrix structure, it could be any counts, but the head of my "data" in the code above is as below"
For a given gene, how will you illustrate the connection between its result in DESeq and it's (dependent) result in edgeR? A gene A in edgeR and DESeq will get twice a logFC and a p-value, so you cannot plot these at the same time using a volcano plot. I have done DEG analysis by both edgeR and DESeq2 and I checked the overlaps of both package in my both conditions (condition1 and condition2) using a venn diagram and I tried to annotate the common/overlap transcripts reported in both exact test and GLM method. I also checked the results using SARTools. So, now I have two volcano for edgeR and DESeq2 that have about 30% overlap of DEGs in condition1 and 50% overlap in condition2. I was wondering if I can show all these in a single volcano plot using 3 colours. sorry, is it two different contrasts each of which has been tested using both edgeR and DESeq2? I have used the same data and same expressin counts resulted from Trinity for condition1 and condition2 for both edgeR and DESeq2 and focused on the overlaps base on this idea if multiple programs give you the same results, then you can be confident that those results do not depend on the particular assumptions that are made by the programs/statistic tests. Good idea! I will check and compare MA plots, too. Aren't MA plots similar to Volcano plots, in a whole perspective? When plotting, you need to think what the message is that you want to give. In this case, that's quite unclear. and also make it clear for the readers that the core DEGs you have chosen in the most conservative approach are significantly differentially expressed in both two statistical packages. 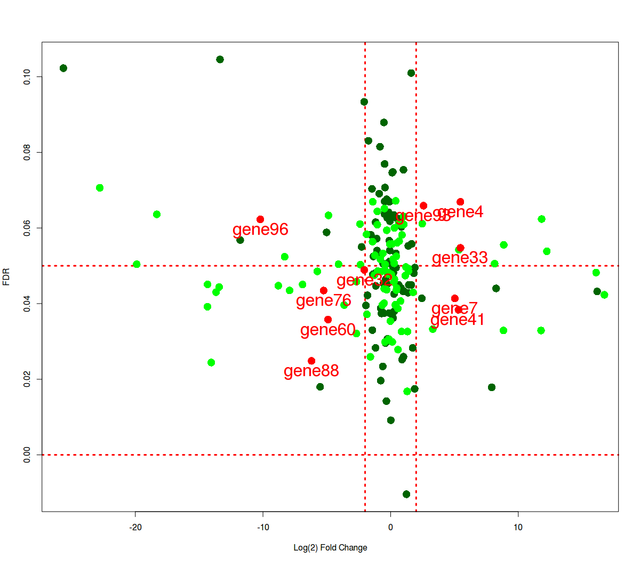 Try this in basic plotting: (note: I created two dataframes with 100 genes and each dataframe shares 10 common genes with identical FDR and logFC). Common genes are colored in red . and labelled, rest in green and light green. 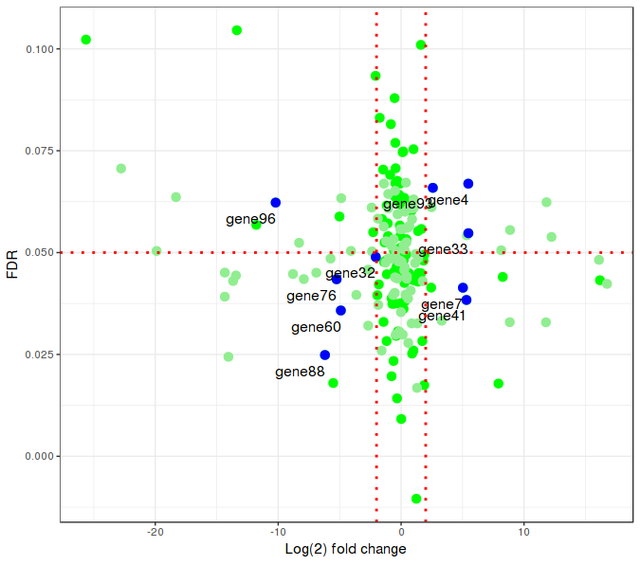 ## Replace same genes in dsq with values above so that edge and dsq share 10 genes with identical FC and FDR. I don't quite understand the filtering. Surely it's extremely unlikely that the fold-changes and the FDRs match between the DESeq and the edgeR runs isn't it? the FDRs and FC are not the same numbers in two approaches, but the order of IDs are somehow the same. first DEG in cond1 in deseq2 is same as first DEG in cond1 in edgeR and so on. I moved your comment to an answer, could you please merge your last comment to this answer? Dear cpad0112, Hi and thank you. I will try your valuable code and ask some more question then, as R is always not so friendly to me. Thank you for your valuable script. I will try it and share the results/problem with you then. How to add single gene name in volcano plot ? How to change colour of points in volcano plot by common genes? How to add stats. to volcano plot? why two packages have not similar FDR ?? ?